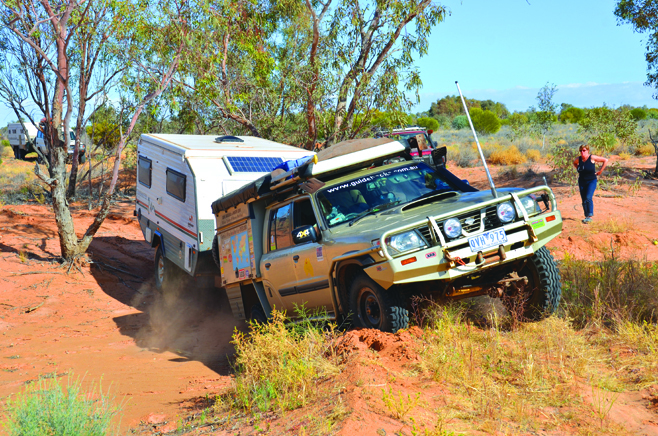 After months of negotiating Ron and Viv were finally given access to the privately-owned off-road tracks that stretch across the Strzelecki Desert; from the Old Ghan Railway line to the goldfields at Mount Browne. Water was flowing vigorously across the track. As we got out of the Patrol to investigate the source of our unexpected road block a flock of ducks whirled into the air and circled us. You could tell they wanted to put some distance between us and them, but here in this dry desert country their choice of places to go was pretty limited. They needed to stay near the life-giving waters which had formed a small oasis amongst the low desert dunes. 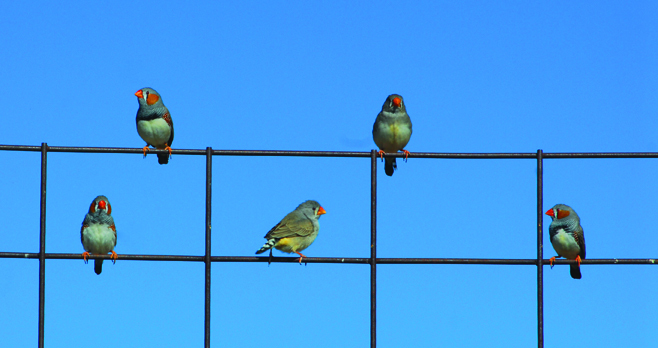 Zebra finches flittered into the scrub nearby, even more reluctant than the ducks to leave the small narrow waterway. While a few hundred metres from us a lone dingo skulked away, looking furtively over its shoulder as it did so. The bore head, the source of the water, was tucked in amongst scattered lumps of lush but spiky vegetation and piles of red sand that were way too small to be called a 'dune'. The bore, shrouded in steam, was gushing near-boiling hot water at a powerful rate, albeit unable to free flow as it once did as it’s now capped and controlled. We were on the southernmost edge of the Great Artesian Basin. Here, the deep and hot waters have been the lifeblood of sheep and cattle properties, and small outback communities, since the first well tapped the rich resource near Bourke in 1878. So quickly did other drills tap the basin that by the early 1900s many people realised that some form of control was needed to conserve the supply, but it really wasn't until 1999 that governments enforced programmes to stem the flow. The track we were following, which essentially goes from one remote bore to another, was once the main link between the goldfields around the tiny townships of Milparinka and Tibooburra in north-western NSW and the railhead in distant SA. That railhead was Farina, known back then as Government Gums, in the very north-west of the Flinders Ranges. The Great Northern Railway (we call it the Old Ghan Railway) had reached here in 1882 having been pushed north from Port Augusta. Farina was to remain the railhead for a number of years before the line was forced through to Marree. But in the meantime the small town saw many hopeful prospectors set out in search of their own El Dorado. Copper had been discovered in early 1863 just east of Farina in amongst the rugged hills of the northern Flinders at Yudnamutana. The Waukaringa Goldfield, out on the plains and south of the whiteness of Lake Frome, was discovered in 1871. A few years later gold was discovered over the NSW border at remote Mount Browne and at the nearby Granites and so the Albert Goldfields, as they were called, began attracting thousands of would-be hopefuls. In late 1882 famine and a lack of water reached such dire circumstances on the Albert Goldfields that a relief supply was sent out by the NSW government. Surprisingly, the NSW relief party first went by ship to Port Augusta, then by train on the recently completed railway to Farina and then by camel across the northern Flinders (probably via Mount Freeling police station and Terrapinna Waterhole). From there the party followed the track we were now on, known today as Mount Browne Track, which parallels the Yandama Creek across the Strzelecki Desert to the NSW border and then east on to Milparinka. 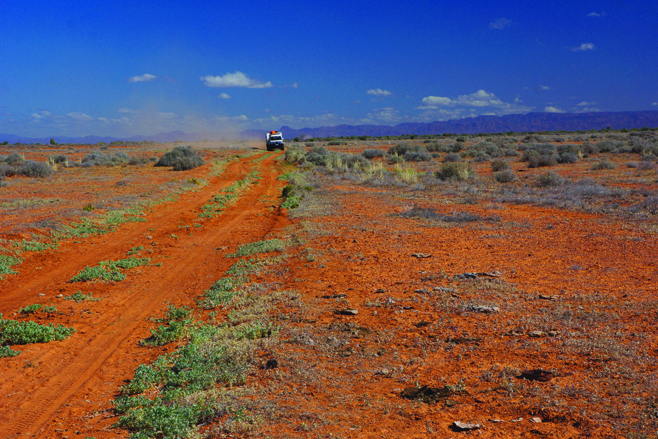 The Mount Browne Track, that traverses the Strzelecki Desert, was first known as the 'Old Hawker Road'. 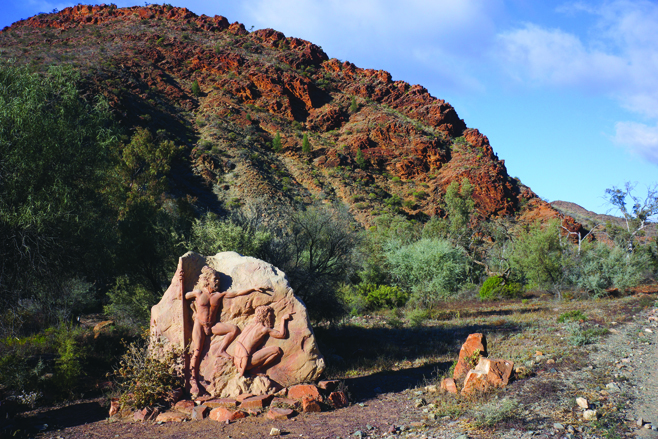 Hawker was an earlier railhead in the central Flinders Ranges and an important stopover point for places further north and east, including Waukaringa and the Albert Goldfields. That also explains how Hawker Gate, on the NSW and SA border section of the Dog Fence, got its name. Even though the governments in both SA and NSW sunk a number of bores during the 1890s to help succour travellers and stock, the stretch across the desert in SA remained a 100km waterless wasteland for many years. When Fred Blakeley (famous for his involvement with the Lasseter 1930 expedition) and a couple of mates rode their bicycles across this same track, going from one hot flowing bore to another in 1908 (told in Fred's book, Hard Liberty, published in 1938) he passed over 30 graves of earlier and luckless prospectors. After discovering the existence of this little known historic route we wanted to travel it. So, after a lot of effort getting permission, we gathered with a couple of mates at Farina before setting off. Today Farina is a top spot to camp along the gum-shaded creek (from whence it got its original name) and with all the recent restoration work that has been going on around the old townsite it’s worthy of at least a couple of nights. Located just 24km north of Lyndhurst the town at its peak once boasted two hotels, a brewery, a police station, a school, an underground bakery (now reinvigorated and working for two months or so each year) and a population of over 500 people. There was also a busy railhead where camel trains and donkey teams headed out into the ranges and desert country carrying supplies to distant mines and pastoral runs, while rich copper ore and wool were brought in for shipping south. Until the 1960s this tiny outpost was also the southern terminus for the Strzelecki Track, now located at Lyndhurst. We headed directly east from the one-time railway line, following the route of the early pioneers across station tracks we had received permission to use. With up-to-the-minute advice from the station owners we had little trouble finding our way across the desert landscape. We passed the ruins of the Lorna Doone Mine and came to the main workings of the Lynda Mine, which we explored before pushing on to the homestead at Mount Lyndhurst. 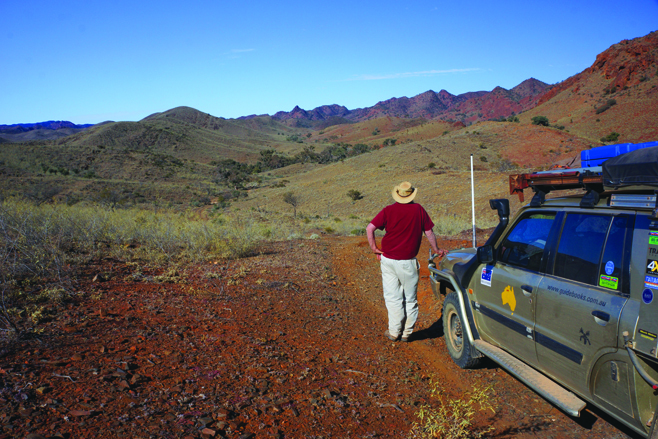 Here we got more advice for our travels further east towards the old mining settlement of Yudnamutana, which nestles up against some of the most rugged peaks and ridges of the northern Flinders Ranges. From Mount Lyndhurst station we wound our way eastward through desolate range and hill country; the presence of water given away by mobs of kangaroos and flocks of birds, while the lack of water in other areas was brought to light by the complete absence of animals. For a while the track stayed close to an (almost) dry Frome River, before crossing the streambed. The route's importance in the old days was confirmed by the dry stone walling we found along the way where the road had been built up to ease the passage of heavy ore wagons and the like. Near one old stone well, close to the track, was a conspicuous natural rock face. On closer investigation it revealed a number of engraved names and signatures in the most delicate flowing script – some inscriptions dated back as far as 1875. This told us we were on what was once a major thoroughfare. We camped that night on the edge of the Frome and then pushed on to Yudnamutana where we camped the night in the protection offered by the rugged peaks around us. We've been here many times and yet we always seem to find something new in and around the site of the old smelter and its two remaining big boilers. Down the hill is a small cemetery which is well worth a visit, if only to learn the misery of a woman who was shot by her husband the day after Christmas in 1906. The next day’s travel was on roads I’d travelled before, but this time heavy rain a month earlier had washed away sections of the route and now the sharp narrow creek crossings demanded a bit of road building to get the rigs through. 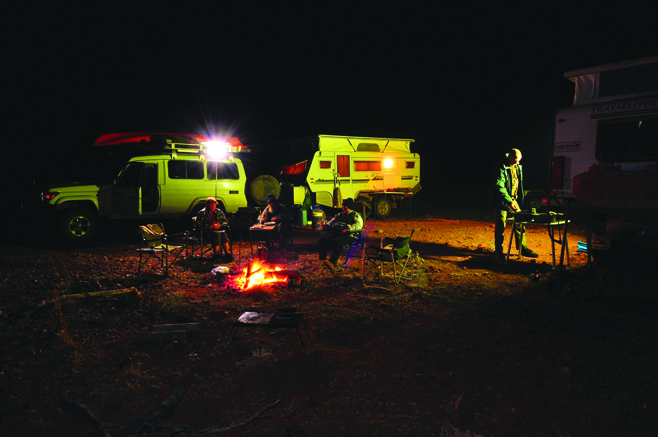 That evening we soaked in the luxury of the Arkaroola Wilderness Resort, one of my favourite places in the Flinders Ranges. Next morning saw us out on the eastern plains on a dusty track heading away from the ranges and passing through Dog Fence before coming to the flowing bore that had cut the track. Once we had dodged around the short creek, and the water disappeared into the thirsty sands, we again swung east as the track began to parallel Yandama Creek. For the next two days we travelled easily and slowly from bore to bore, a few more of which were flowing boiling hot water to form an oasis that attracted not only cattle but lots of birds and the occasional dingo. In his book Fred Blakeley talks about these very same bores and, when he discovers natural flammable gas is also present, he postulates on the area being a great source of energy. Little did he know that he was very close to the truth; 60 years later, just a little north, the Moomba gas fields began pumping their liquid energy to Adelaide, Sydney and Brisbane. 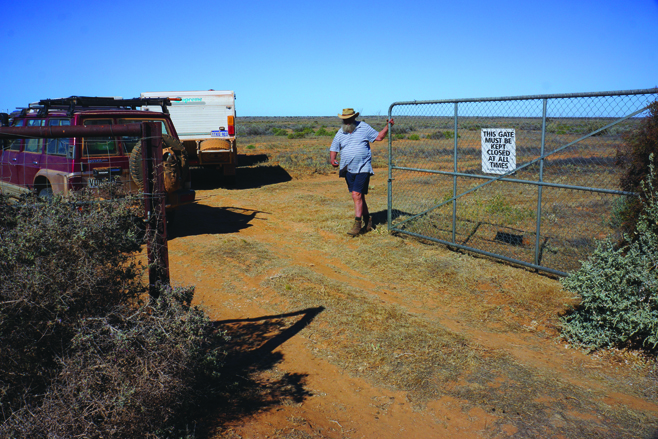 Finally, but all too quickly, we passed through the Dingo Fence at Hawker Gate on the NSW border and drove onto a wide public road and continued east – running parallel to Yandama Creek, before passing Yandama homestead. Further east again, on a good dirt road, we soon passed Depot Glen. Here, explorer Charles Sturt was trapped for over six months in 1844 as he tried to push north to the centre of Australia and the 'Inland Sea' that many people of his day thought existed. 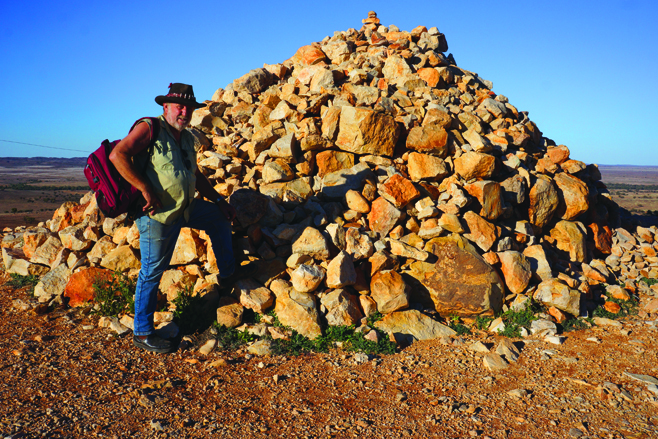 There are a number of monuments worth a visit here – as well as the historic cairn Sturt's men built on nearby Mount Poole. 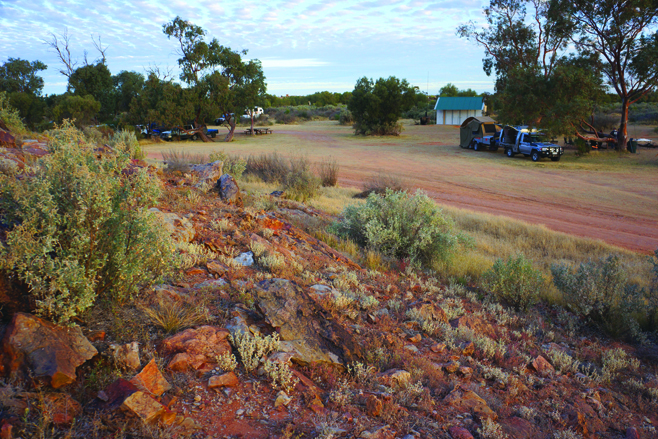 We pushed on a short distance to the small hamlet of Milparinka which, along with Tibooburra just 30km or so north, were the epicentres of the region in the boom days of the Albert Goldfields. Today the Albert Hotel has re-opened; a couple of people live just across the road and the local historical society has done a swag of work and rejuvenated a couple of the fine old stone buildings that once graced this town. The camping area just down from the pub seemed a good bet for us. So, we set up camp then wandered up to the hotel to celebrate our little adventure with a cold beer and a good meal. We mightn't be able to do the Old Hawker Road ever again, but there is no doubt we'll be visiting both Farina and Milparinka once more – they are too good to bypass. This route, when in South Australia, crosses a number of large, privately owned pastoral properties. Permission to travel across some of these cattle stations is very difficult to obtain. After numerous phone calls, emails and letters – and separate trips to all the properties to talk to the owners – we managed to obtain permission. The consent was given reluctantly with the premise that it would never be given again! Passage through the locked Hawker Gate on the Dog Fence, that marks the NSW and SA border, must also be arranged. Once in NSW the roads east from Hawker Gate to Milparinka are all publicly accessible. Farina has a fabulous small bush camping area. The Farina Restoration Group (www.farinarestoration.com) has done some fine work partly restoring the many buildings there. The old underground bakery runs for a couple of months each year during peak tourist season. 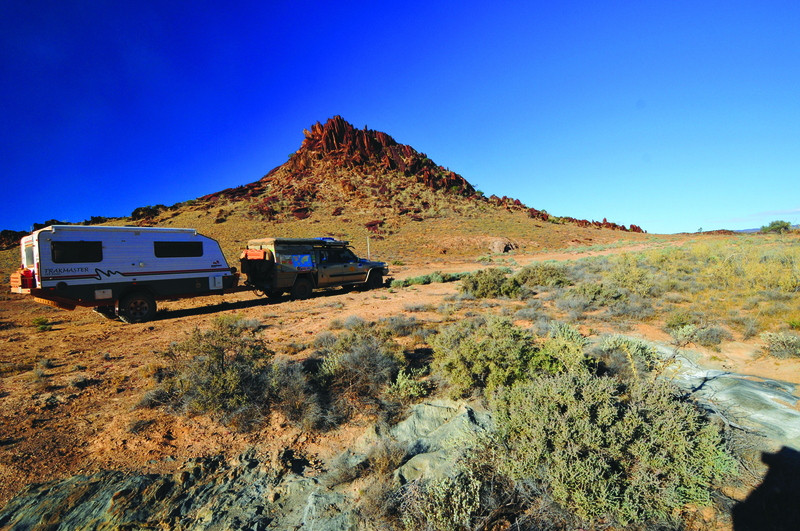 The Arkaroola Resort and Wilderness Sanctuary (www.arkaroola.com.au) in the rugged northern Flinders Ranges offers a range of camping and accommodation. 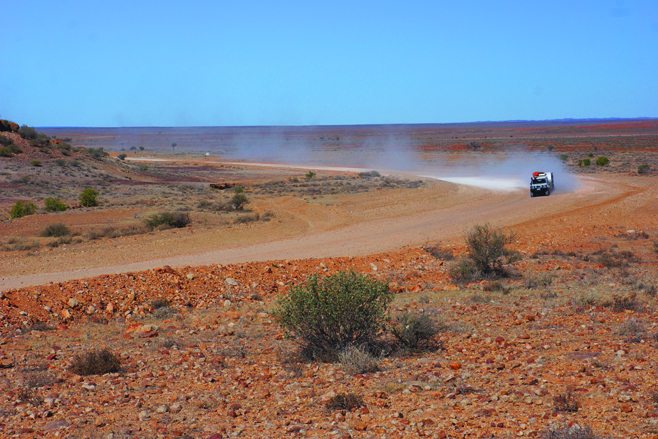 Fuel, limited supplies, meals, tours and self-drive 4WD tracks are also available. At Milparinka the old Albert Hotel is again open and offers cold beer, good meals and accommodation. Just 100 metres away a camping area has been established. The Milparinka Historical Group has renovated a couple of the notable buildings that once graced this town and a small museum is well worth visiting. Sadly the nearby old Mount Browne Goldfields are currently being worked on and access is closed to the public. Get the latest info on all things 4X4 Australia by signing up to our newsletter.